There are so many Christmas items it's hard to know where to start. Here's a quick roadmap. ALL Christmas Rubber Stamps are On Sale! NOTE: the Christmas Collage Sheets have all moved to the new site! 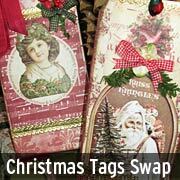 We've put all the Christmas Scrapbook Papers (single sheets or sets) in their own section. On Sale! And there's a section of Christmas & Winter Metal Charms. On Sale! This is a custom search query of everything we could think of (red or green ribbons, Dresden trims... things not covered in the categories already mentioned on this page). Read about Santa Claus and Thomas Nast on the Victorian Illustrations History Page.